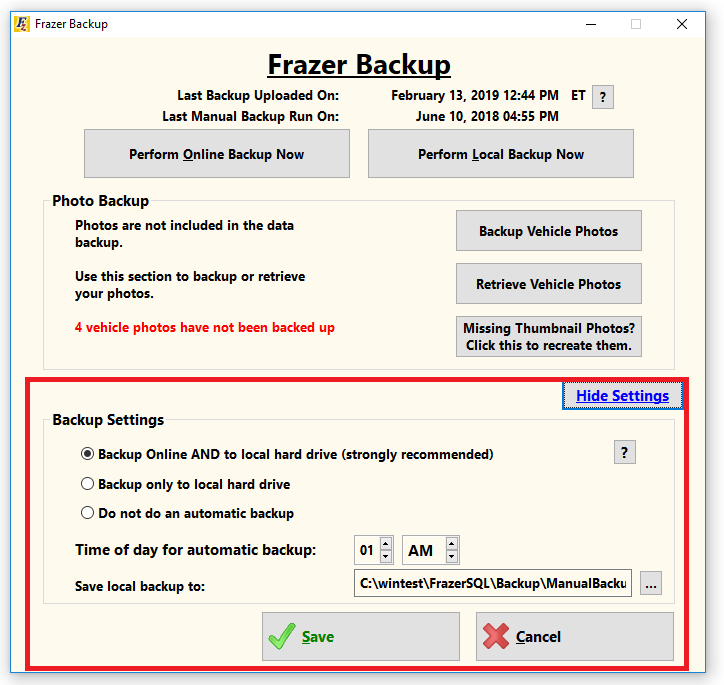 Automatic backups are a convenient feature that allow you to restore your Frazer system to a previous date. This can be especially helpful in the event of a server crash or anything that may prevent access to the main computer such as natural disaster or business loss. To set up or change the settings for the automatic backups, go to the "Backup" drop-down menu and click on "Show Settings" at the bottom of the screen. Three Automatic Backup Options are available. Select the desired option and the best time of day for the backup to occur. In order for the automatic backups to work, The server computer (the computer or server on which Frazer is installed) must be ON and awake (not asleep). Our system default is 3:00 AM, but if you don't want your computer on that long, we recommend setting your backup for 30-45 minutes after you typically close your business for the day, and then adjust the sleep settings for your computer to be for approximately an hour after inactivity. On rare occasions where you work late, don't worry, Frazer's backup system will still pop up and run the backup at the scheduled time. If the process did not complete successfully, a message will appear stating that process was not successful the next morning when you come in. •Computer is not turned on. •Computer falls asleep before the scheduled backup time. •An anti-virus or firewall program blocks the auto backup process by mistakenly identifying the sofware as malicious. •Windows local Firewall / Proxy settings / Internet outage. •3rd party backup programs (Example: Carbonite) can cause havok with the automatic backups. If you're concerned with failed backups and not sure where to proceed give us a call at 888-963-5369 and one of our friendly techs can help with any of the above scenarios (and much more)! Your online backups are stored on Frazer's secure servers. The local backups are saved on the local main computer's hard drive in the Frazer30 > Backups > ManualBackup folder. Each local backup is labeled with the date and time.